I'm beginning to think today's UK music scene is the European equivalent of the Pacific Northwest. Of course both places share the same type of weather, which I'm beginning to wonder if that's the recipe for making those gloomy heavy riffs sound so bliss. One of those bands that caught my fancy is Dystopian Future Movies. And their recent album, "Time", is a sweet mix of 90's alternative with a doomy post-rock atmosphere. Wasteland is a perfect opener, as it displays Caroline Cawley's talent and beautiful voice. It's a nice mellow track that reminds me of the singer-songwriters growing up. Pieces is a song I enjoy because it has a great build up. For some reason, it feels like a song about someone who committed the ultimate sin, and they are now fucked, and now has to live with that burden. When I mentioned 90's alternative and doomy post-rock, Dissonant Aggressors was the song that made me think that. 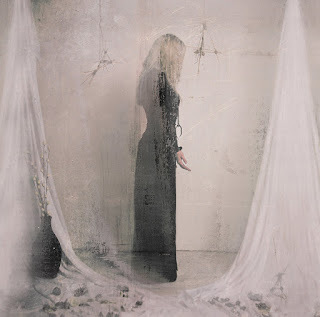 Just hearing that clean guitar blending with some guitar noise (provided by Rafe Dunn), feels like Chelsea Wolfe and Mono got together and jammed in the middle of a ghost town. Then the drums come in and just create a very cinematic feel. Then we got Fortunate Ones, which was my introduction to Dystopian Future Movies. When I heard this song, I knew there was something very special about this band. The opening got my interest. Then when Caroline sings "We're the fortunate ones. Then the future, it runs right through you", it just got me hooked. It's something I know the teenager in me would get behind. On the Dystopian Future Movies Facebook page, the band describes their sound as heavy melodic/haunting post-doom, which fits perfect. When I first heard them, I would have thought they were from Portland or the Bay Area. Mainly because I associate that doomy shoegaze sound with the Pacific Northwest. But when listening to the whole album, you start hearing other musical elements, like folk and a little bit of noise rock. The rhythm section is killer. The bass that Oisin O'Doherty provides gives the band a very crushing sound, which contrast Caroline's guitar melodies very well and Bill Fisher keeps the machine rolling with his skin beating. Definitely dig those post-metal beats on Dissonant Aggressors. These two dudes really accompany Caroline's guitar work, which I really love. The melodies that Caroline Cawley provides goes very well with the lyrics. But her guitar work also feels it has a story of its own, which makes me admire Caroline's songwriting work and she knows when to get heavy when there's a part that fits. With the bands work ethic, I'm pretty sure people will start making noise about Dystopian Future Movies, here in the States. There are definitely bands I can see them doing shows with. Hopefully this becomes a reality. "Time" is a really rocking album that fans of Chelsea Wolfe, Marissa Nadler, Slowdive, and Swans can dig. Its dark, haunting, crushing, and melodic. The perfect soundtrack when driving to the Palm Desert/Joshua Tree area. "Time" can be purchased directly from Dystopian Future Movies about on cd, vinyl and digitally. Tape copies can be purchased here - https://dystopianfuturemovies.com/store.